Padmé’s wedding gown from Star Wars Episode 1 is a carefully arranged insanity of antique lace, cording embroidery, pearls, tulle and taffeta. My motivation to make it is not that I am planning to get married. In fact, that will never happen. The only person I would ever want to marry hates me; and I practically just live from year to year for the one day of that year when we call each other. No, wanting to get married was not my motivation; and anyways, my own wedding dress would look different (namely: Elizabethan versus Edwardian style; also, blue instead of white). However, I found the hunt for accurate materials to create a faithful reproduction of Padmé’s wedding gown challenging – all in all, that hunt took two years. Yes, you read that right – two years. I could have probably managed to find the materials in less than three months, but that would have cost more than a used car; I’m not kidding you on that matter. You know the rule – buy quick, buy cheap, buy quality; you usually just get just two of those three. I opted for cheap and quality, and therefore had to sacrifice time. Note that “cheap”, in this case, still means more than US-$1,000 for the materials. However, shelling that money out over a timespan of over two years was easier than having to shell it out all at once. Let me start by discussing…. 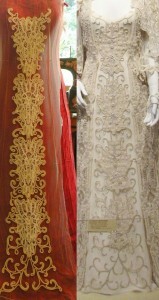 The gown uses quite a few different materials and also various lace types. The veil, as can be clearly seen in the picture above, is bordered by Maltese lace. 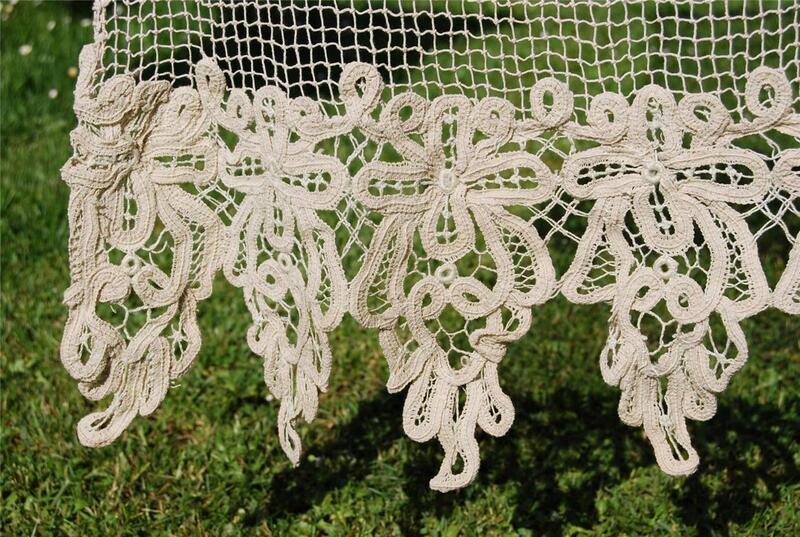 Maltese lace originates from Malta, an Italian island, and is (very!) 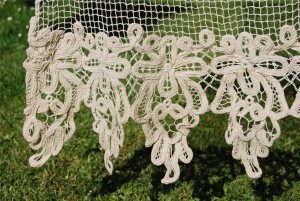 easily identifiable by the Maltese crosses which are worked into the lace design. The veil is also covered with what looks like spirals of pearl drops on stems – those are actually artificial flower stamens. They were, historically, made by dipping thin, paper-wrapped wires into wax. 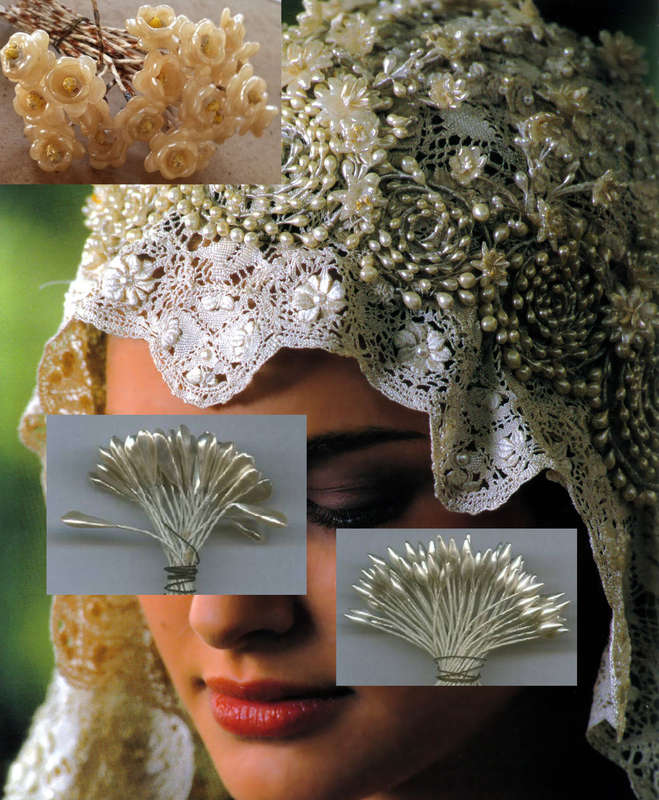 There are also Edwardian Wax flowers scattered all over the cap that covers the head, which, too, are traditionally made from wax (and also came on paper-wrapped wires). And yes, those are REAL, antique (c. 1900-1920) wax flowers and stamens. Particularly the flowers, of which I only have 90 (which is barely enough for the veil cap! 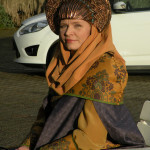 ), did cost a fortune; and sewing them onto the cap prevents me from ever having the possibility to actually wash the veil. Still, they are the one and only true way of imitating Padmé’s veil because they ARE the “real thing”. 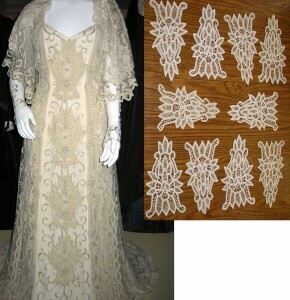 The original gown apparently uses the lace that was cut from a 100 years old bedspread. The lace is a tape lace; I am not quite sure about the type, which could be Brussels lace, Battenburg lace or Vologda lace. 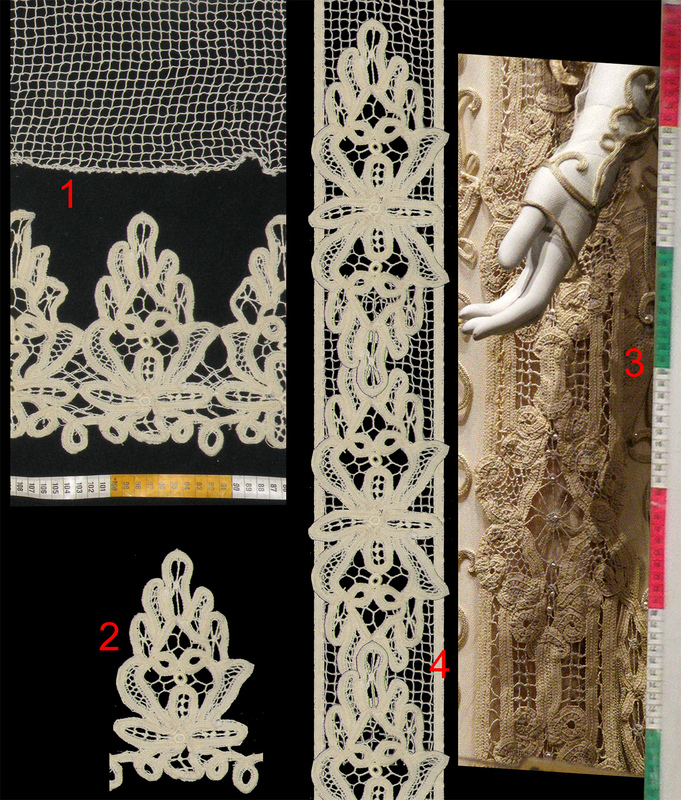 Generally, though, it has to be said that those types of lace are extremely similar, and basically the only real difference is that they originate from different countries. Let’s quickly clarify terminology – I will call the entire ensemble the “gown”, which consists of a dress (which is either a corsage (strapless) or spaghetti strap dress) and a coat, which goes over the dress. While they are not exactly like the original symbols, they are rather similar in shape and particularly in size. Also, adding the cording embroideries around them (which have also been added around the symbols on the original gown) will make them look even more similar; so I am rather pleased with them. Then there’s the side trim on the coat which is worn over the dress. That one was tricky, and it took me quire a bit of time to find something that would work. 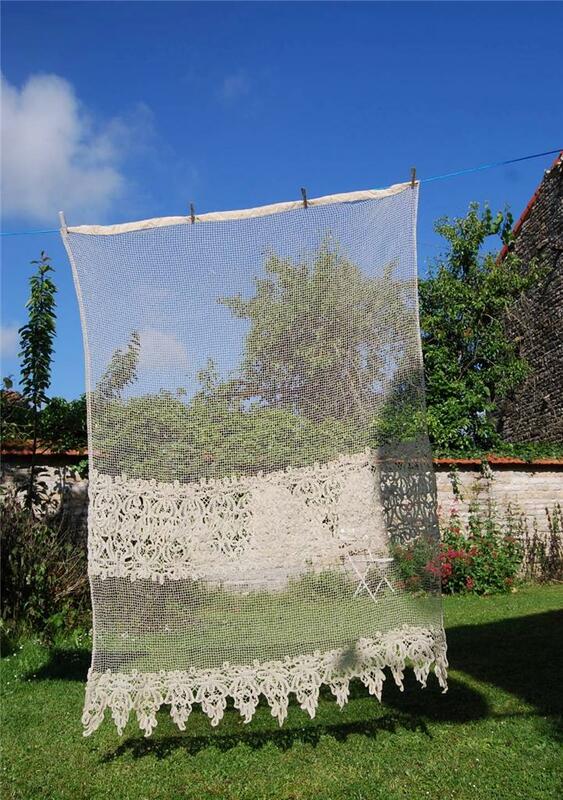 which basically consists of three rows of Brussels lace trim, which have been sewn to a handmade linen net. The wider area of lace at the center bottom is really just the very same lace that can be seen at the bottom; just that the zigzag edges have been sewn together facing each other. Here’s my digital plan for cutting the curtain lace apart to achieve something that will closely resemble the trim on Padmé’s gown. “Digital” means that this photo is photoshopped. I did not dare to cut into the lace before I exactly knew where and how I had to cut, and I found it safer to find a working cutting layout on the computer before actually cutting into the precious lace. 4: What I am planning to create from the cut symbols and the linen netting. As you can see, by cutting the curtain up and reassembling the lace pieces, I can achieve something that VERY closely resembles the trim we see on Padmé’s gown. I am aware that this is not EXACTLY the same lace pattern; but it’s close enough – and also, it’s exactly the same TYPE of lace. Plus, as a friend of mine said, it’s antique lace, just like on the original gown; making the reproduction even more of an heirloom piece. 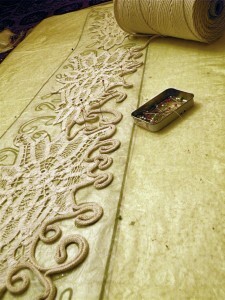 Starting the cording on the center front piece of the underdress. Center front piece cording finished with Battenburg appliqués (left) compared to the original gown (right). The tulle to which I am stitching down the cording is incredibly fine and thin. That’s why you barely see it in this picture, where it is draped over a red dress. My perfectionist self is FREAKING OUT about your painstaking reproduction of this dress. I can’t wait for more updates! What you’ve done so far look absolutely perfect. Just a heads up, Malta is a Republic and is not associated with Italy (it isn’t an Italian island). That would (much!) depend on the price of the lace that is required for this gown, and how quickly you need the gown. You see, those types of laces aren’t new; and searching for (or rather: finding) them at good prices can take years (I think I mentioned that it took me two years to find the lace for my own gown, yes? ), or it would take at least a few weeks to months (!) to find them at regular prices – which, in return, would mean a five figure amount JUST for the lace; no work done with that lace yet – and that work isn’t few, it’s MUCH with all the cording, taking a ton of time (=also months). So somewhere between $3,000 and approximately $15,000, I would say. So excited to see you making the wedding dress your next challenge! Will be closely following your progress as you share updates! Best wishes on your project!